The Supreme Court has ruled that the State was empowered to withhold any information on various important issues, including national security, international relations and crime investigation. Keen to earn the goodwill of NRIs from the state, the Punjab Government has decided to appoint ‘NRI numberdars’ in villages which have a sizeable population of expatriates. In an emotional appeal to overseas Indians, the country’s Ambassador-at-Large B.K. Agnihotri urged that NRIs/PIOs should assist in the country’s development “not with the motive of profit but for being an integral part of the whole process”. “Mere tokenism was not enough for contribution to this development process,” he said. 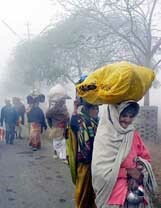 Villagers carry their belongings in an attempt to escape the ongoing cold spell in Allahabad on Sunday. At least 650 persons have died in more than two-weeks' deadly cold snap that has gripped northern India. President A.P.J. Abdul Kalam today called upon the non-resident Indians (NRIs) and persons of Indian origin (PIOs) to share their knowledge to help India become a developed nation. “Make your family in India happy and use your knowledge and experience to make India developed,” Mr Kalam told a gathering of NRIs and PIOs at the Rashtrapati Bhavan Moghul Gardens. 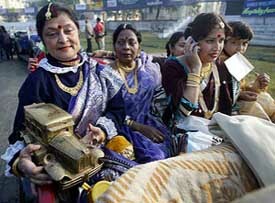 Women wearing traditional dresses sit inside a vintage car at the Vintage Car Rally in Kolkata on Sunday. More than 150 vintage cars and two wheelers took part in the rally. Former Chief Election Commissioner M. S. Gill today said the adjudication on party defections should be left to the Election Commission. The Election Commission has formulated a 10-point guideline on holding free and fair Lok Sabha poll. The election to the Andhra Pradesh Assembly and a few other states may also be held simultaneously with the Lok Sabha poll. The Bharatiya Janata Party today promised to make the country a global economic power if it was voted to power for the next five years. Amid hullabaloo over conferring of honorary doctorate on RJD chief Laloo Prasad Yadav by Patna University at its convocation function today, Mr Yadav has refused to accept the honour. Muslim organisations in city have announced a reward of Rs 1 lakh to ‘blacken’ the face of British writer of Indian origin, Salman Rushdie. He has arrived in Mumbai after a Christmas holiday in north India. The nation today paid homage to former Prime Minister Lal Bahadur Shastri on his 38th death anniversary. India to launch Geo-synchronous Satellite in 2005. Buffaloes being kidnapped for ransom in Madhya Pradesh. Pooja Bhatt talks about her directorial venture, Paap. “Every right — legal or moral — carries with it a corresponding obligation. It is subject to several exemptions and exceptions indicated in broad terms,” a Bench of the Chief Justice Mr V.N. Khare and Mr Justice S.B. Sinha ruled. The court said the government has a right to withhold information relating to international relations, national security including defence and public safety, investigation in crimes, internal deliberations, confidential information received by the authorities from their sources outside the government and information about the privacy of an individual. “Unlike Constitutions of some other developed countries, however, no fundamental right in India is absolute in nature. Reasonable restrictions can be imposed on such fundamental rights,” the court said, adding that Article 19 (2), which deals with the right to information, itself gives government privilege to withhold the information in public interest. This has been elaborated in detail by the court in a judgment rejecting People’s Union of Civil Liberties’ petition seeking to make public safety measures relating to the nuclear installations in the country. The court further said the government could also withhold from public information economic issues, which if disclosed, would confer an unfair advantage on some person, or subject some person or any authority to an unfair disadvantage. Besides, information regarding legal advice, scientific discoveries and even physician’s advice could also be held back by the government, it said. When any claim of privilege was made by the State in respect of any document when it was challenged in the court of law, the court has first to decide whether it fell in the category of “privileged class of documents” or not. “The court cannot hold an enquiry into the possible injury to the public interest, which may result from the disclosure of the document in question. The claim of immunity and privilege has to be based on public interest,” it said. The government is planning to seek the high court’s approval to enable the fast-track courts in the state to deal with matters relating to NRIs. It has also decided to include an NRI representative in the district grievances committee. Punjab Chief Secretary J. S. Gill told the NRIs at the Pravasi Bharatiya Divas function here that the state government had taken several steps to remove bottlenecks relating to their investment proposals. Participating in the session on ‘Diaspora’s Interaction with Punjab,’ Mr Gill said villages which had at least 20 NRI households were entitled to have an NRI numberdar. He said rules were being framed and would be notified by January 25. The numberdar will look after revenue and related matters pertaining to the NRIs, he said. The thrust of the speakers at the interaction was on using Punjabi enterprise to take Punjab to the top of development indices. Ms Sukhi Turner, Mayor, Dunedin City, New Zealand, appealed to the assembled NRIs to adopt their native villages and contribute to their development. India’s Ambassador-at-Large Bhishma K. Agnihotri said there was need to present a glorious picture of Punjab and wipe out the impression that Punjab had problems. Mr Agnihotri, who was born at Hoshiarpur, said he would work with the Punjab Government for the success of the four-day global Punjabi meeting to be held in April. Punjab Public Works Minister Partap Singh Bajwa said the opening up of trade with Pakistan would give a boost to the economy of the state. He said the response of the bureaucracy had not been inspiring to the changing investment scenario. Mr L. M. Singhvi said the global Indian family could be a great civilisational, political and economic force. He said Punjabis were great achievers and at the forefront of public service. Responding to a query, Mr Singhvi said with the introduction of dual citizenship, it had become easier for NRIs to acquire agricultural land but the enabling legislation was in purview of the state government. “We should be more responsive to each other’s needs and there should be real spirit and inspirational motives behind the help offered,” he said, addressing a session ‘Synergies between India and the Diaspora’ as part of the second Pravasiya Bharatiya Divas celebrations here. Mr Agnihotri said as India is moving towards its goal of becoming a developed nation by 2020, it had to overcome many obstacles and hurdles. “We have problems on many fronts and I feel that the 22 million people of Indian origin residing abroad have to play an important part in our journey towards development. “A developing India has lots of needs and you have to understand that we all have to work together, as one global family to fulfil them,’’ he said. The country, Mr Agnihotri said, faced problems on the front of healthcare and education, especially due to rising cases of AIDS and also in providing elementary and higher education in villages and remote areas. “Tackling these successfully is very important for us as we move forward in the path of development,” the Ambassador-at-Large said. He said South Africa had sought assistance from India in the form of language teachers in Hindi, Tamil and Gujarati and other languages and materials in order to help children of Indian diaspora in that country. “We are working on a Memorandum of Understanding (MoU) between India and South Africa which will focus on education,” Narend Singh, Minister of Education and Culture in the Province of Kwazulu-Natal, South Africa, said. Former Union Minister and eminent educationist Y K Alagh emphasised the need for greater partnership in various spheres such as agro-processing, education and upscaling technology order to derive maximum benefits. They stressed the need for a more healthy network among all Indians scattered in various locations across the globe and also for a more focussed approach to development. President A.P.J. Abdul Kalam today called upon the non-resident Indians (NRIs) and persons of Indian origin (PIOs) to share their knowledge to help India become a developed nation. “Make your family in India happy and use your knowledge and experience to make India developed,” Mr Kalam told a gathering of NRIs and PIOs at the Rashtrapati Bhavan Moghul Gardens. Departing from protocol, Mr Kalam mingled with the guests who are here to attend the Second Pravasi Bharatiya Conference. He identified agriculture, education, healthcare, information technology, infrastructure and high technology as areas where thrust was needed. "You have to share your knowledge in these fields,'' he said. To a question on ways to removing corruption, Mr Kalam said no matter how many laws were passed to prevent the scourge, father, mother and the elementary schoolteacher could make the difference. Asked what his passion was, the President said he wanted 260 million people to smile. “In a nation of a billion people, 260 million live below poverty line. We have to lift them up,” Mr Kalam said to an applause from the audience. He said women's education was being given the highest priority. To a question about checking population growth, he said improvement in the status of women would ensure small families. Among those present were former President K.R. Narayanan, Vice-President Bhairon Singh Shekhawat, Minister of State for External Affairs Digvijay Singh, former Prime Minister I.K. Gujral, Mauritian Deputy Prime Minister Pravind Jugnauth, Lord Meghnad Desai and Mr Jean Pierre Harrison, husband of the late astronaut, Kalpana Chawla. “Prompt hearings and firm and fair immediate decisions by the commission will more or less kill the cancer of political defections,” he said. The new guidelines, which the EC tentatively drafted after the recent meeting of Chief Election Commissioner J.M. Lyngdoh in New Delhi with state electoral officers (CEOs), will aim at ensuring free and fair poll. According to sources the guidelines are: only electronic voting machines be used in casting of votes and its counting; only those voters whose names are enlisted in the final draft electoral rolls, to be published on January 20, will have the right to exercise their franchise; polling personnel and observers be elected and appointed by the Centre and State Government offices, various public undertakings, agencies and educational institutions; no political personnel be involved in electioneering directly or indirectly; no government employee holding the post of office-bearer in union or an employee involved directly in political activity be allowed to take part in the election process; no minister at the Centre as well as states and other political party members, holdings government offices as chairmen or director, be allowed to utilise government vehicles and official machinery during campaigning; no police and other government employee having a “questionable” track record be allowed to take part in conducting of elections directly or indirectly; no party or candidate be allowed to use government electronic media and information wings in the campaigning; all candidates to furnish their income tax return and detailed sources of funding in the electioneering as and when asked by the EC after the filing of nomination; persons with adverse police records (convicted on murder charges, militant activities, espionage and other serious criminal activities) will be debarred from participating in the election process. At the EC’s meeting, the sources said, CEOs of all states were told to be ready for the election at short notice. They were also asked to send new suggestions and proposals to the Election Commission at the earliest. Mr D. Bandopadhyya, CEO, West Bengal, who returned to the city today after attending the meeting in New Delhi, has called a meeting of election officers of the districts on Tuesday to brief them about the outcome of the Delhi meeting. Mr Bandopadhyya said all necessary steps had been taken as per EC’s guidelines and the code of conduct. At the meeting on Tuesday, he would discuss how to strengthen the state election machinery on the basis of the EC’s new directives. He said the work on the revision of the electoral roll was continuing in full swing. He hoped that the final revised electoral roll in the state would be published within the stipulated period. In its economic resolution which was adopted by the two-day meeting of the National Executive, the BJP recounted its achievements during the past six years and outlined a roadmap for the future. The six-page resolution, proposed by Commerce Minister Arun Jaitley and seconded by Information and Technology Minister Arun Shourie, promises to transform India into a global manufacturing hub by undertaking the expansion of airports, railways and seaports. The Vajpayee government, if voted back to power, would expedite power sector reforms in accordance with the Electricity Bill 2003, the resolution said. It stressed the need for an improvement in labour laws to ensure higher productivity and greater employment generation. Briefing newspersons about the resolution, Mr Jaitley said the party would put the country at the centre of a knowledge economy since India had the capability, skilled manpower and core effectiveness. “Education centres of excellence with public and private support to strengthen research and development will be encouraged and developed”, the resolution said. The resolution said the BJP would initiate a process of urban renewal as there was a need for the revitalisation of the urban sector. The BJP would empower agriculture, the resolution said, adding that the party would work for a job-oriented growth. Stressing the importance of peace, the resolution said the party would strive for bringing prosperity to Jammu and Kashmir and the North-East when peace started returning to these terrorism-hit areas. Mr Yadav had reportedly taken the decision following the uproar, which had rocked the state after a proposal in this regard was mooted at the Patna University Syndicate meeting on December 20. Subsequently, differences cropped up among Syndicate’s senior teachers and Deans over the proposal. Later, the Syndicate authorised Vice-Chancellor K. K. Jha to put the proposal before the Governor and Chancellor M. Rama Jois for his approval. Meanwhile, youth RJD members tried to self-immolate before Raj Bhavan, supporting the proposal. Salman Rushdie, accompanied by his campanion, Padma Lakshmi, is camping at Taj Mahal Hotel in south Mumbai. The Muslim organisations have planned a dharna on Monday at Azad Maidan in protest against Rushdie’s visit to Mumbai and the tacit approval of the government to his visit. His son Anil Shastri was among those who visited Vijay Ghat to pay tributes. Delhi Chief Minister Sheila Dikshit along with some of her Cabinet colleagues paid tributes to the late leader at a function at the samadhi.